NOTE: All athletes, including each relay team member, must pick up their race packet themselves. You will need to show a photo ID and present your USA Triathlon membership card if you are a current member. Minors must have a parent or legal guardian present at registration. 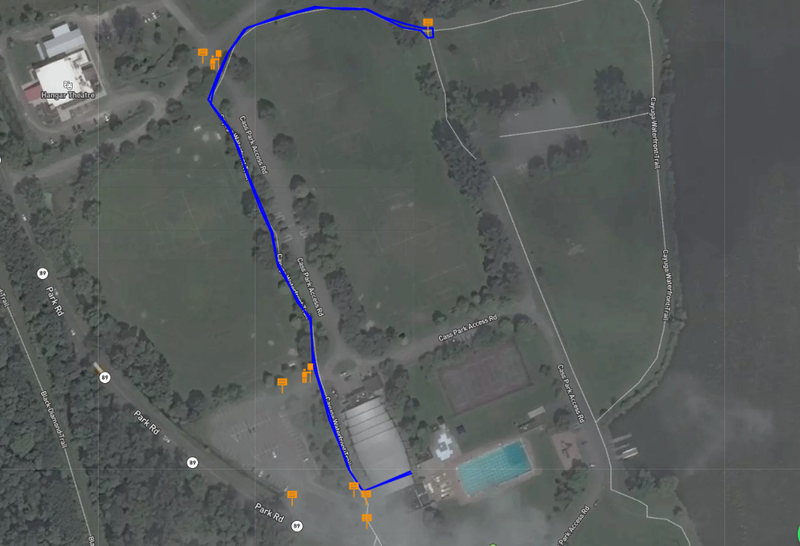 Maps below are indicative of routes; actual race routes are measured precisely. 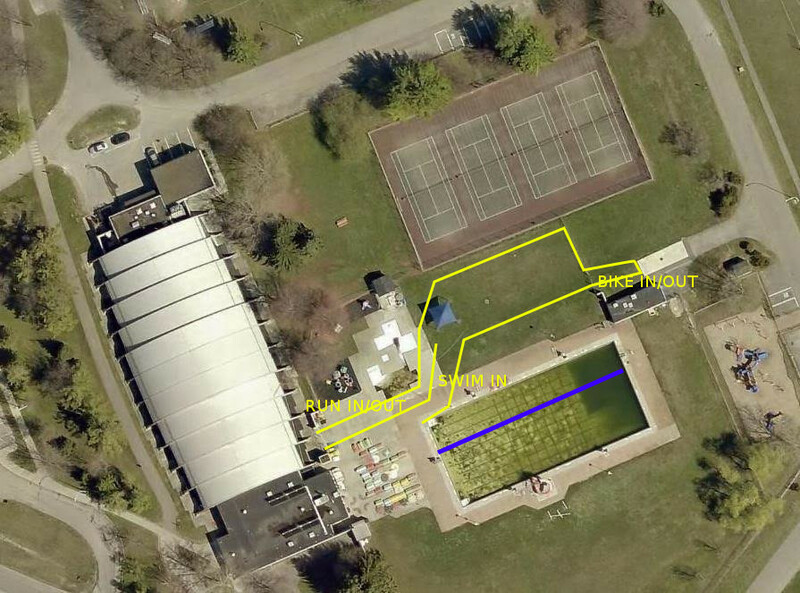 Swim: 1500 meter swim in Cayuga Lake (out and back course) – South Shore of the Park. Bike (map): 24.3 miles heading north on NYS RTE. 89 to Sheldrake and back. Run (map): 10K (two loops) in the Park including up the Gorges Trail to the Falls and back. Note: the map shows a huge elevation gain, but this is an artifact of the mapping software. The run route is relatively flat, following only Taughannock’s base trail. INTERMEDIATE AQUABIKE: 1500m swim and 24.3mi bike only! 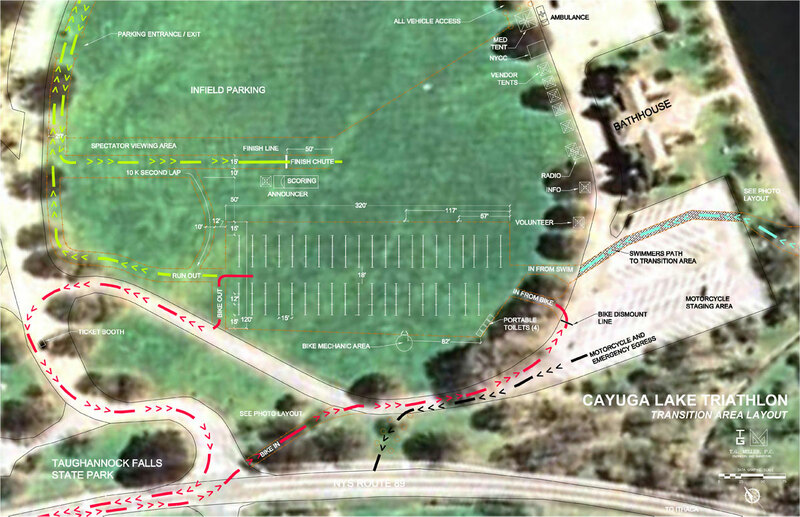 Swim: 750 meter swim in Cayuga Lake (out and back course) – South Shore of the Park. 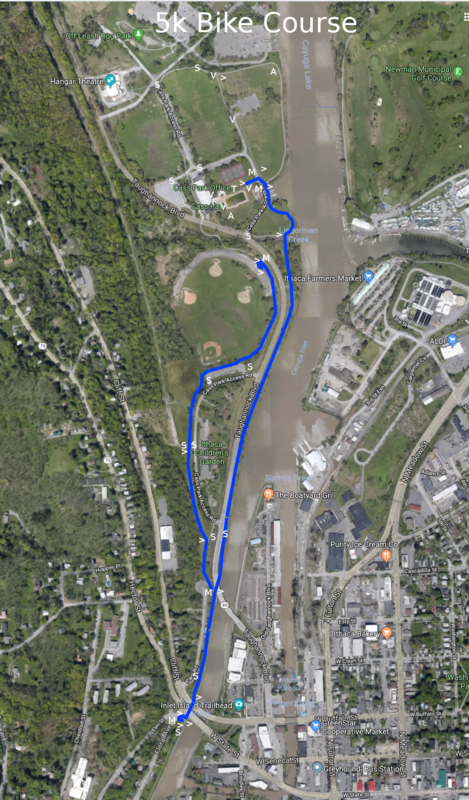 Run (map): 5K (one loop) in the Park including up the Gorges Trail to the Falls and back. Note: the map shows a huge elevation gain, but this is an artifact of the mapping software. The run route is relatively flat, following only Taughannock’s base trail. Bike (map): 9 miles heading north on NYS RTE. 89, then back to the Park.From Taughannock Falls State Park the Youth bike course heads north on NYS Rte. 89 for about 4.5 miles. The turn around is at the Scenic Pull-0ff (near Booth Road) and NYS Rte. 89. After the turn around cyclists will head south on NYS Rte. 89 back to Taughannock Falls State Park. Run (map): 1.5 miles in the Park up to the NY89 Bridge and back.